As many of you are aware of, we do occasional consignment sales for collectors who are adverse to eBay or the "big auction houses". We recently received a couple of bottles from a collector up north that we just don't see; ever. Both are Portland picture whiskies and both are just flat rare. We've seen a total of two of one and three of the other over the past 40 years. Both are tooled tops and clear in color. I realize that this may well turn off some of the purists out there, but for those who appreciate fancy, full faced embossing coupled with extreme rarity, this pair is tough to beat. 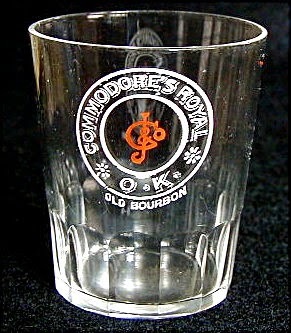 They are "Commodores Royal OK Old Bourbon". The embossing patterns differ slightly; with one having "KY" after Bourbon; the other "Rye" after Bourbon. The other primary difference are the names of the proprietors; Marx. & Jorgensen vs. E. C. Jorgensen. I learned, a long time ago, not to publish what has been regurgitated as fact for the past 50 years. As such, I spend a great deal of time trying to either verify, or discredit, that which has been accepted as gospel with regards to western whiskey history. The history of this pair of pictures is almost as tough to come by as the bottles themselves. There's been little to nothing written about them and Portland newspaper and business directories are scant to non-existent compared to San Francisco. John Thomas was, in this particular instance, for the most part correct. According to Thomas, the firm of Marx. & Jorgensen had their start up in 1877. This is probably either correct, or quite close. (the newspaper article in the closing chapter of this article states 1876). 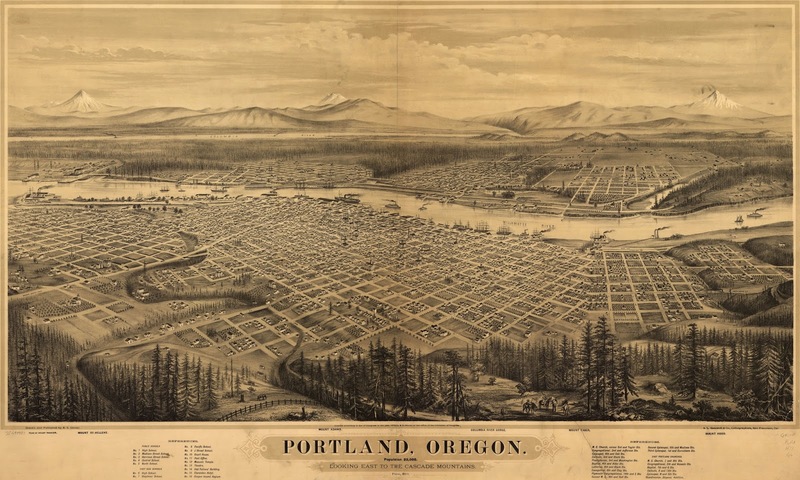 I located an ad from "The Daily Astorian" dated January 26, 1879 stating that the firm already had an established branch operating in Astoria, Oregon, which is 98 miles by river, downstream from Portland. Astoria has, as many will recall, been the source of more than just a handful of rare whiskies (and bitters) over the years. 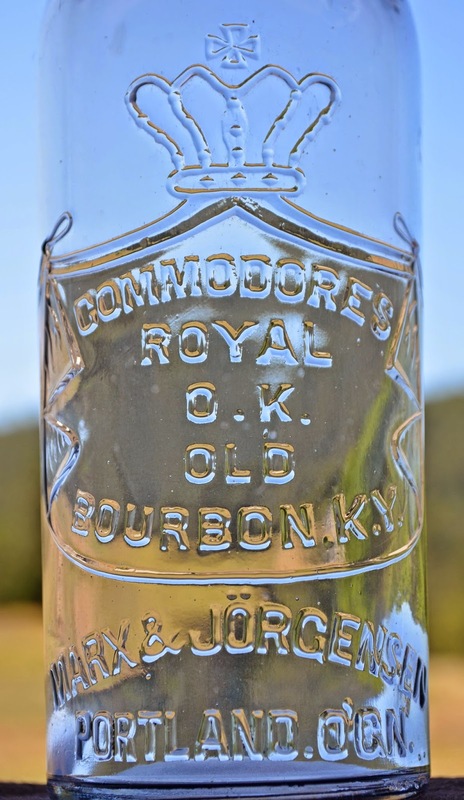 According to what I was able to glean, their product line appears to have been exclusive to one brand, "Commodores Royal Old OK Bourbon". 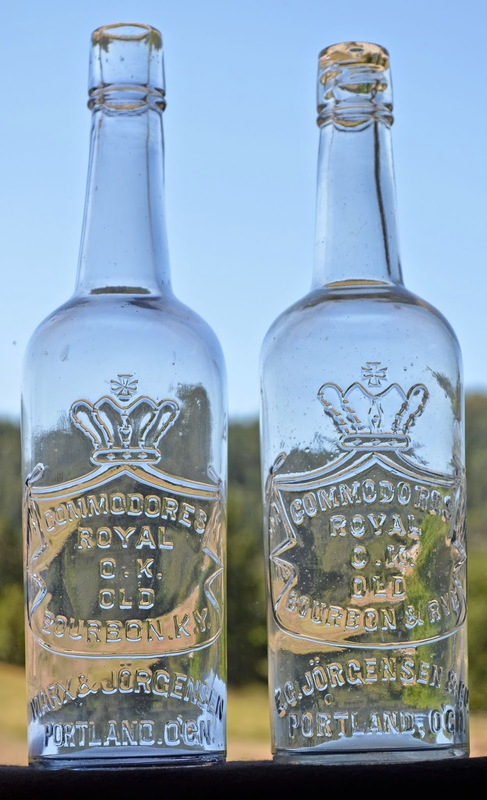 It was Kentucky bourbon whiskey, which was casked at the distillery on the east coast (I was unable to determine who the distiller was), shipped in hogsheads via railroad, and bottled initially in embossed private mold amber glop top cylinders in Portland. This bottle is quite rare, and is considered to be one of the top Oregon whiskies. Later, a clear "German connection" glop top cylinder was produced. This bottle would date. ca. early to mid 1890's. About the same time, a domestically produced tool top was also blown. Neither the amber glop, or the clear tool tops are embossed with the name of the product. The third variant in the lineup of embossed Marx & Jorgensen cylinders is a "real hitter". It would date from approximately the same era as the prior variants; ca. early 1890's - 1902. 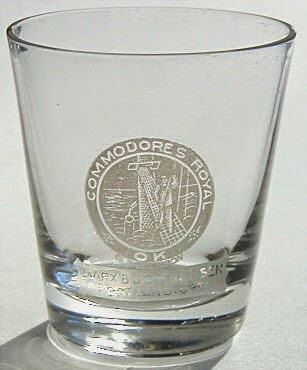 It is embossed with full faced coverage "Commodores / Royal / OK / Old / Bourbon K.Y." inside of a large ornate draped crest topped by a large jeweled crown, with "Marx & Jorgensen / Portland Ogn" beneath. (why the period after both K and Y in KY?). The bottle was blown with a manganese dioxide based de-colorizor that allows the bottle to turn purple when exposed to UV radiation (sunlight). It has a long tapered collar over single ring closure that was sealed with a cork. The shoulders were air vented by a series of six small vents. The base was air vented in a like manner. The embossing does not bear any indication of air venting, although it is extremely bold and crisp. The base is plain and void of mold marks or glasshouse identifiers. We are unable to ascertain for certain which of the glass factories blew this variant, although all evidence points to San Francisco & Pacific Glass Works. A pair of matching acid etched advertising shot glasses were produced to advertise the brand. Commodore is a military rank used in many navies. The etch pattern is reflective of this, picturing a commodore on the rigging of a sailing ship. On January 11, 1902 a notice appeared in the Portland newspaper "The Morning Oregonian" , which signaled the beginning of the end of the firm. The notice was a "dissolution of co-partnership", in which Daniel Marx announced his impending retirement. Emil C. Jorgensen would assume the roll of president and the responsibilities of the firm. E. C. Jorgensen & Co. was comprised of Emil C. Jorgensen as president, Carl F. Bartholama as vice president and Max Fleischauer as secretary. The two partners were rumored to have bought out Marx's interests upon his retirement but, to our knowledge, no concrete evidence to support this exists. After the changing of the guard, a new mold was commissioned for bottles. All production techniques noted above with regards to the prior bottle apply to this bottle as well and it too, will turn purple. This variant closely resembles the original with a couple of exceptions. Obviously the change of company name was reflected in the new embossing pattern. Another small change is in the product itself. Rather than stating that the bourbon was "K.Y. ", the new mold states Bourbon & Rye. This indicates that the product was now being distilled and rectified on the west coast; no doubt to reflect the growing acceptance of west coast bourbon whiskey (and rye whiskey) and also to decrease expenses and increase profit. One other difference encountered, although rarely, is the presence of the Riley patent inside thread closure. Thomas had never seen an example, but noted the supposed existence of one example with this new style substitute for the old cork style top. The example we have is believed to be the one that John referenced. 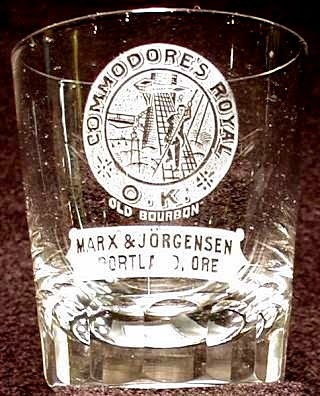 In keeping with the advertising theme of the era, an acid etched shot glass, sans Marx & Jorgensen was also produced. The death knell of E. C. Jorgensen & Co. sounded on December 31, 1905. An article appeared in "The Morning Oregonian" announcing the closing of the firm. And so, with this brief announcement, the doors to the firm of Marx & Jorgensen, and E. C. Jorgensen & Co. closed for the last time. Thankfully, we have two full faced picture whiskies and three acid etched picture shot glasses, which were produced for the firm, to remind us of these two men, and their Commodore brand. All are rare. Commodores Royal O.K. Old Bourbon K.Y. Marx & Jorgensen Portland OGN. My wife and son were out trout fishing on a small stream in Grays Harbor County near Aberdeen Washington. The fishing trip was in the summer of 2011. My wife noticed there was a bottle hung up in a root wad that was half way across the stream. My son convinced my wife to collect the bottle which was muddy and dark green in color. They brought the bottle back home. 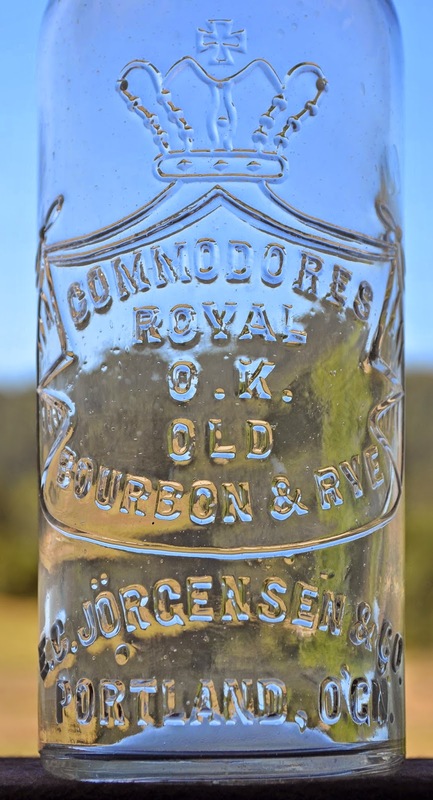 You could see there was writing on the bottle and after taking off mud and green algae it read “Commodores Royal O.K. Old Bourbon K.Y. Marx & Jorgensen Portland OGN”. I contacted various collector sites asking about the bottle –but no one responded to my quarries. Finally, I talked to a member of a bottle club in Seattle he said that it was quite the find—western whisky bottles were in demand and this one was rare. He suggested I contact a dealer in California at an auction house. I called the auctioneer and he was familiar with the bottle. He told me if it was two toned it would be worth quite a bit of money and suggested I clean it carefully. So, armed with guide book after guide book I slowly started cleaning. As I cleaned the bottle the green disappeared, and it became obvious it was not two toned, instead it was clear. The more I cleaned the more beautiful the bottle became with a little bit of iridescence. The only nick on it was a small fish eye near the applied top area. Evidently, when the bottle floated down the creek it hit something and caused the mark. The rest of the bottle does not have a single scratch. The bottle is really beautiful. We went back to the stream twice looking along the banks and in the water but found no other bottle or any other area that had old debris like a garbage dump. It is a total mystery. The area has a logging history and a logging railroad was there in the late 1800’s. I can imagine a celebration where the whisky bottle was opened for whatever reason and thrown away after it was empty. I wish the bottle could talk, I would love to know the story. Where did it come from? Who bought it and why? Was it bought in Portland, or Astoria? Was it on a ship that came into Aberdeen? Was it traded? Of course, we will never know but I do know that was an incredible find and it is a beautiful bottle. The small fish eye makes the bottle special and unique and matches my wife and sons “fishing Trip” perfectly.